A JAL Boeing 777 on the first flight from Kobe Airport taxies to the runway.KOBE -- Kobe Airport opened on Thursday morning, marking the third airport in the Kansai region. At 7:19 a.m., a fully-booked Japan Airlines (JAL) Boeing 777 bound for Tokyo's Haneda Airport took off from the runway on the manmade island. 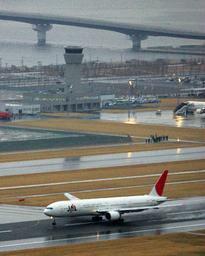 It is the 97th airport in Japan and the first one build and operated solely by the municipal government. The city is required to repay approximately 300 billion yen in debts that covered the construction costs. At 5:50 a.m., an inauguration ceremony was held at the departure lobby of the airport that was congested with departing passengers and airport officials as well as ceremony guests. "I hereby declare the Kobe Airport open," Kobe Mayor Tatsuo Yada said in the ceremony. Security checks on passengers' baggage took longer than expected, delaying the first flights of each airline by four to 14 minutes even though there was no major trouble or confusion. The airport was build on a 272-hectare manmade island about eight kilometers south of the busy Sannomiya district of the port city with its 2,500-meter runway stretching from east to west. 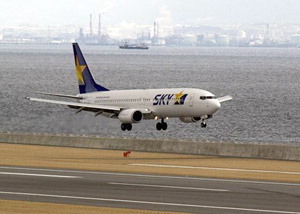 It is open from 7 a.m. to 10 p.m.
JAL, All Nippon Airways and Skymark Airlines will operate a total of 27 round-trip flights between Kobe and seven destinations including Tokyo, Sapporo and Naha. The municipal government estimates 3.19 million people will use the airport a year.